In the last day of public comments by FOMC members before the whole committee entered purdah the market was treated to three separate statements. First off was Neel Kashkari. He knows little about monetary economics and it showed he hasn’t bothered to find out anything since his appointment. He should take this course for starters. At least is he is enthusiastic and inquisitive. In a blog post entitled “Nonmonetary Problems: Diagnosing and Treating the Slow Recovery” he rather airily dismissed the idea that the slow recovery was due to poor monetary policy. He tasked his economics team at the Minneapolis Fed with building on some random thoughts of Greg Mankiw in a New Times op-ed. Mankiw came up with five, Kashkari and his team added two more, I think. I have read so many of the secular stagnation theses and other ad hoc nostrums I go a bit bored. The trouble is, the Fed has buckets of credibility. Despite “struggling to hit its current target” it ended QE in 2014, threatened all through 2015 to raise rates and did so in December. And then the Fed projected four more 25bps hikes in 2016 and around eight more within two years or so. What on earth effect does Kashkari think all that actual and clearly threatened firepower have on inflation expectations? No wonder the inflation data the Fed is so dependent upon keeps disappointing. Still Kashkari is a lot more dovish than his two peers in the Kansas (George) and San Francisco (Williams) Feds, and will swing the average vote much more dovish in 2017 when it is his turn to vote. This was the big one. The speech worried markets on Friday 9th September when it was announced, especially after a litany of hawkish regional Fed presidents reiterating their inane and extremely tired views on the coming hyperinflation unless rates were raised soon. The markets need not have worried. Brainard echoed many of the very sensible comments made by her governor colleague Tarullo. The last point echoes what we have identified coming from the Bank of England, that 2% is not necessarily a ceiling, although the Fed is not yet saying that about projected inflation. There is no mea culpa, that the Fed has caused the inflation undershooting by excessively tight monetary policy but, hey, we can’t have everything just yet. And all this is going to be evaluated in the “months ahead”. Read my lips: no September, November or even December rate hike. A good news day! Last month, John Williams wrote an “out-of-the-mainstream” letter. He was quickly reined in and three days later “toed the line”. One of the most influential Fed doves has announced that she will speak on Monday, Sept 12 on the US economy in Chicago at noon local time (1 pm ET). The location is the Chicago Council on Global Affairs and they say she will discuss “the economic outlook for the United States and monetary policy implications” and will be in conversation with Michael Moskow, who was CEO of the Chicago Fed. Maybe it’s been in the works for a while, maybe she’s been dispatched to reel in hike expectations for September 21. Either way, that’s going to be a critical speech. The fact that she´s regarded as an “influential dove” increases the “likelyhood” of a September hike if she so indicates. It will certainly be interesting to read. The Federal Reserve and other central banks like to see themselves as “data-dependent”. They sit in objective judgement of the facts of the economy as revealed by “data” and then portentously decide whether to attempt to alter the future facts with monetary tightening or loosening. FOMC splits, and it is a good thing! It had already been argued here last month that the FOMC looked like it was splitting judged by the January 2016 Minutes. We said that this was a good idea given the hopeless leadership from the Yellen/Fischer axis. It has also been looking like William Dudley, newly reappointed as governor of the NY Fed, has been expressing the market views even more clearly. Letting markets set monetary policy is a good thing, the sum of all views and not just those of a few people sitting on a committee. Well, it looks like the split has come to pass. The newswires were hot when Brainard gave a clearly dovish speech earlier this month the very same day as uber-hawk Fischer tried to claim that inflation was about to accelerate out of controlfour more hikes . With hindsight, the particularly old school speech Fischer gave to the NABE looks to have been even more of a retirement speech than it read at the time. His disastrous “four more hikes” interview in early January has damaged his credibility beyond repair, his retirement cannot come too soon. As we argued in February, especially after looking into Brainard’s biography she is a deeply political figure, very close to the Clintons. If Hilary is to win the election only a fool or an inflation hawk (they are often the same) would think that tightening monetary policy is a good thing. Just to be clear, Market Monetarists are hawks too, whenever nominal growth is persistently above trend. If we are right and politics has split the FOMC then we are in for a really good spell of dovish monetary policy out of the Fed. Yellen’s comments today show either someone confused, covering up a split or secretly supportive of the splitters – and against the Fedborg and their “normalisation” mania (remember that). She said nothing much had changed on fundamentals but the FOMC wanted to be more accommodative. She said that the FOMC had declined to declare where the bias on risk was because some thought them balanced but some thought them to the downside (ie the splitters) – “there is no collective judgement in this statement … we declined to make a collective statement”. She said that the things pushing up core CPI were volatile – but the normal view is that core excludes volatile items. Who cares for now. 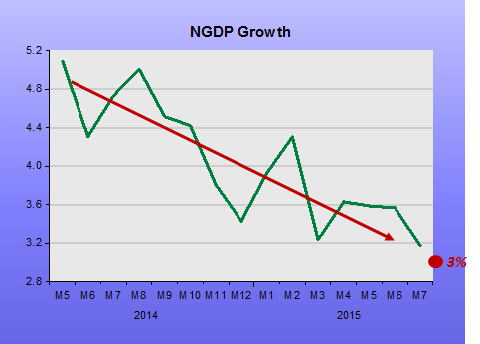 Looser monetary policy in an environment of weakening NGDP growth has to be a good thing. The splitters need to build on their success by shifting focus to NGDP Growth targets and away from targeting, unmeasurable, inflation. A variety of evidence suggests that the longer-run neutral rate is lower now than it has been historically, and that the very low shorter-run neutral rate may adjust to it very slowly, due to a combination of weaker foreign demand growth, greater risk sensitivity as a result of the crisis, higher risk premiums for productive investment, and lower growth in potential output. The lower neutral rate means the normalization of the federal funds rate is likely to follow a more gradual and shallower path than in previous cycles, although the actual path will be determined by economic conditions. It also implies that the likelihood of the federal funds rate hitting the zero lower bound will be persistently greater than it has been previously, which could make it more difficult to achieve our objectives of full employment and 2 percent inflation. With the nominal neutral interest rate lower than in the past, and with policy options being more limited if conditions deteriorate than if inflationary pressures accelerate, the asymmetry in risk-management considerations counsels a cautious and gradual approach. If she listened to herself, she would conclude that what needs “normalization” is not the federal funds rate but the level and growth rate of nominal spending (NGDP). The Fed is holding the economy down! The Fed insists it wants to raise rates before the end of the year, but markets insist in not believing it, because if one uses the reaction function the Fed has always communicated there is no reason to do it. The markets have followed Bernanke’s teachings and learned the Fed’s reaction function over the years, and have concluded that, in view of the economic outlook, interest rates should not be raised until mid-2016. If the Fed has changed its reaction function, it should explain it and openly acknowledge that there are factors beyond the inflation outlook that are affecting its decision making. Transparency is critical. If the Fed is not able to explain convincingly why it wants to start raising rates, the risk of failure will be high. The world economy is in transition and developed economies have to replace emerging markets as a source of stability. The Fed is caught in its own inertia, as it has spent many months preparing the ground for a rate hike in the second half of this year. But the reality is that if one ignores the inertia, there is no good reason to raise rates this year. And, with rates at zero, there is little room to correct mistakes. The Fed is confused, and the cost of this confusion could be very high. The Fed certainly is confused (and after recent talks by Lael Brainard and Daniel Tarullo, divided). It´s not a question that the costs could be very high, the costs are already rising strongly! Since the tapering and post tapering, monetary policy is being tightened. No one would notice that from looking at the Fed Funds rate, which has remained at “zero”. Bernanke himself long ago said that to gauge the stance of monetary policy, don´t look at interest rates, look at things like NGDP growth and inflation. 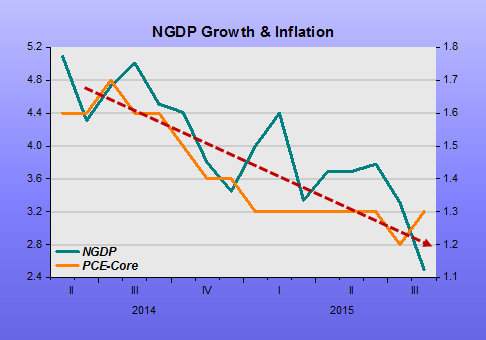 The chart provides clear evidence that according to those two gauges, monetary policy is in tightening mode. The Fed´s revealed confusion only adds to uncertainty and worse outcomes. In other words, the Fed is already failing! The will-they-or-won’t-they drumbeat has grown louder of late. To remove the suspense, I do not intend to make any calendar-based statements here today. Rather, I would like to give you a sense of the considerations that weigh on both sides of that debate and lay out the case for watching and waiting. 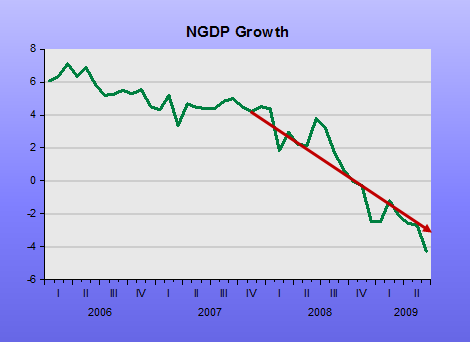 Economic theory suggests, and empirical analysis confirms, that such deviations of inflation from trend depend partly on the intensity of resource utilization in the economy–as approximated, for example, by the gap between the actual unemployment rate and its so-called natural rate, or by the shortfall of actual gross domestic product (GDP) from potential output. To be clear, I do not view the improvement in the labor market as a sufficient statistic for judging the outlook for inflation. A variety of econometric estimates would suggest that the classic Phillips curve influence of resource utilization on inflation is, at best, very weak at the moment. The fact that wages have not accelerated is significant, but more so as an indicator that labor market slack is still present and that workers’ bargaining power likely remains weak. There is a risk that the intensification of international crosscurrents could weigh more heavily on U.S. demand directly, or that the anticipation of a sharper divergence in U.S. policy could impose restraint through additional tightening of financial conditions. For these reasons, I view the risks to the economic outlook as tilted to the downside. The downside risks make a strong case for continuing to carefully nurture the U.S. recovery–and argue against prematurely taking away the support that has been so critical to its vitality. Her speech is of a higher quality than the ones we´ve recently had from most FOMC members, but like the others she slips on “reasoning from price changes” when mentioning oil prices and the dollar exchange rate, and also on “reasoning from quantity changes” when spending time on “GDP components contributions”. But misses the fact that the “gloomier projections of global demand” in no small part derive from the tightening of US monetary policy that has taken place over this period, as can be gleaned, for example, from the falling growth rate of US aggregate demand (nominal spending or NGD). After all, the US is a monetary superpower! And it´s not the case that they don´t know the consequences!